Search Engine Optimization (SEO) is the process of achieving top ranking on major search engines like Google, Bing, and Yahoo without paying for advertising. Often referred to as "free", "organic", "natural", or "earned" traffic, the added visibility of a website positioned on the first page of a major search engine can provide a lot of traffic to the site, resulting in more sales. Search engines are programmed to deliver the best quality information that is most relevant to the searcher. In order to do that, there are more than 200 factors that determine a web page's relevance to a search request. Many of these factors are woven into the fabric of the website such as the framework for mobile compatibility, page headers and content, photos, videos, loading speed and SSL security. Other factors are trust related such as links from reputable sites and social media. It's important to remember that search engines also prefer updated content, that is why SEO should be an ongoing process and not a one-time delivery. Successful SEO requires watchful keyword monitoring and frequent website updates. Will my site be listed on the search engines if I do not provide any optimization? Yes, it is likely your website will eventually be listed on the search engines if it is not optimized at all. However, if your website cannot be located within the first few pages of a keyword search, you won't have very many visitors unless you are paying for some type of advertising. How is SmartCart optimized for search engines? 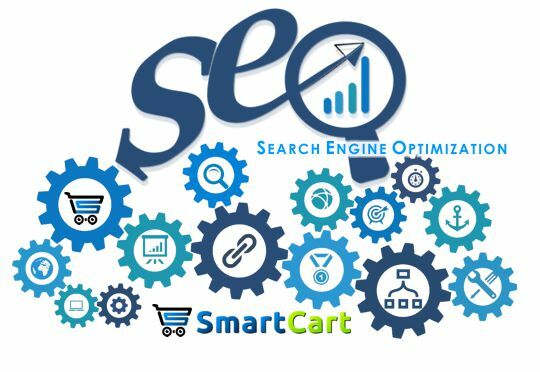 Websites that are managed with SmartCart have some SEO advantages built into the software. Mobile-compatibility, information structure, and website response times all play a major role in optimization, but when this is teamed with insightful information about your business and/or products, you have what it takes to achieve top rankings. The cost for search engine optimization services is based on time spent with research, development, social media support, and reporting. There is a $295 setup fee to begin optimization services (research and setup). Monthly keyword monitoring and website updates start at $100/month. Is SEO included with website design services? Every custom designed website by SmartCart is search engine optimized within the development process. The website framework, site loading speed, page content, and website structure are engineered to provide results. The Platinum Design features advanced SEO and keyword monitoring for the first 3 months. Does SmartCart guarantee that my site will be ranked on the first page of Google? Unfortunately, we cannot guarantee 1st page of Google for all keywords, and you should be weary of any company that offers that guarantee. We offer low introductory SEO pricing with no minimum contracts, so you are able to see results without committing to a large monthly expense.